The single biggest obstacle to having lasting success with Lean is the common misconceptions that abound about “what lean is.” This can be found in blogs, articles in trade publications and in advertisements for technologies and training. Talk of methods, approaches and strategies for “how to use Lean to get results quick” or “what Lean tools and methods you should use for ________” are plentiful. Unfortunately, these don’t help resolve the misconceptions – they help reinforce them. During this session, we will start a conversation on how you can be successful with Lean by going beyond the traditional approaches and examining how to “think Lean.” We will cover how you, your peers and your organization need to start “thinking differently” and charting a course for how to intelligently and appropriately utilize lean. This webinar will address issues of organizational and personnel development, customer-centricity, cultural barriers to success and some ways you can get started. 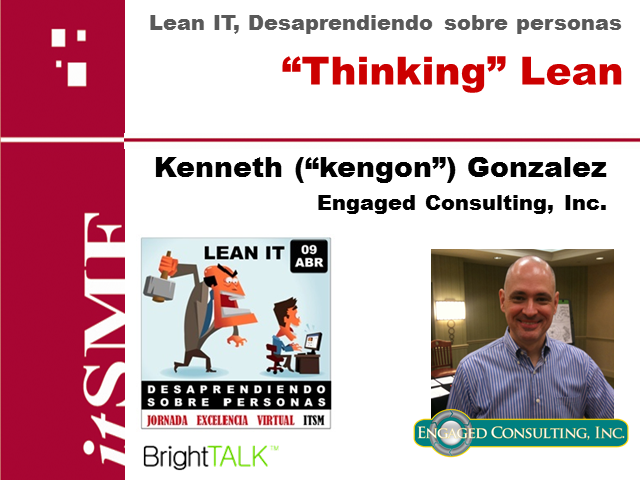 Kenneth Gonzalez, Managing Partner, Engaged Consulting, Inc. Presented by: Kenneth Gonzalez, Managing Partner, Engaged Consulting, Inc.